on October 11, 2017, 4:10 a.m. This month, Apple iPhone is the brand that has achieved the greatest uplift in its Ad Awareness score (whether someone has seen its advert in the past two weeks) in Singapore. 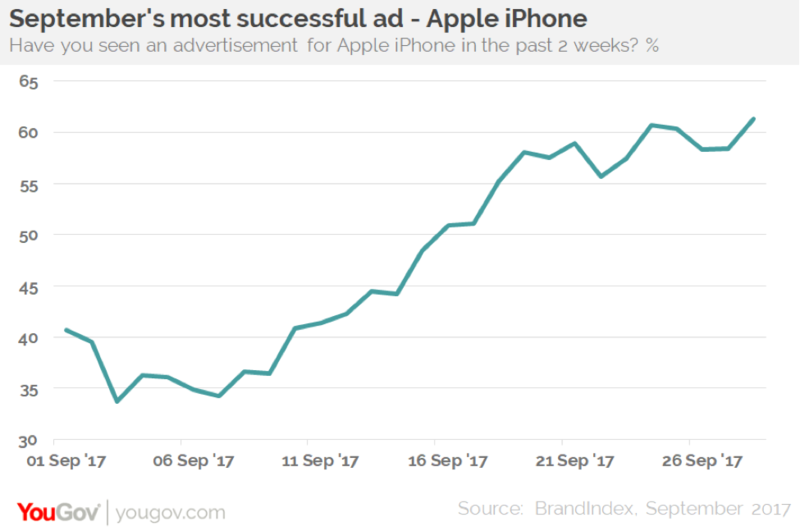 Apple iPhone’s Ad Awareness score rose by 20 points over the course of September, from 41 at the beginning of the month to 61 at the end. The steepest spikes in the increase coincide with the launch of the iPhone X on 12 September and the iPhone 8 on 22 September. However, the launch wasn’t all good news for Apple. One of the headlines that dominated the launch was the iPhone X’s $1,500+ price tag. BrandIndex data shows Apple iPhone’s Value score (which measures whether consumers believe the brand offers good value for money) plummeted around the launch. It fell from a score of 22 at the start of the month to a score of 4 at the month end. Perceptions of the brand’s Quality also fell by 10 points over the course of September. Despite a significant increase in Ad Awareness, the new iPhone has failed to whet consumers’ appetites. In fact, Purchase Intent fell by 13 points in the week ahead of the launch and only recovered by 6 points in the subsequent week. Apple’s stock took a tumble after the event, which analysts believe reflects general disappointment, concerns over new features like facial recognition not working well, and concerns over the increased price tag. That said, Apple remains a key player in the smartphone market, with around one sixth of the market share. Though the recent launch event didn’t appear to wow consumers, the brand’s strong reputation and loyal devotees mean it’s likely to remain a dominant player in the smartphone market. Indeed, its recently opened Apple Store on Orchard Road continues to attract consumers, with reports of huge queues outside the store for the new iPhone 8. Stephen Tracy, Head of Singapore at YouGov, had this to say about the findings, “The Apple iPhone launch has been and remains to be an iconic event in the world of consumer technology, and we’ve historically seen significant increases in buzz and ad awareness for Apple around this time of year. However, the stakes we’re considerably higher this year with this being the iPhone’s 10th anniversary. It does look like the official unveiling of the iPhone 8 and X didn’t quite live up to the hype, with investor confidence and consumer interest not hitting the levels we expected. That said, Apple’s current market share in Singapore plus the debut of the country’s first Apple Store earlier this year will likely keep the mobile device maker above water. But whether the iPhone 8 and X will be enough to stave off increasingly stiff competition from the likes of Samsung, Xiaomi and Oppo remains to be seen."